We are among the pioneers in the industry, engaged in offering Fibre Optic Audio Multiplexer System Interface Unit to our esteemed customers. Offering a wide range of Fibre Optic Voice Multiplexer System Interface Unit. These are made from high quality raw material. The aim of the configuration is to interface 2 wire high signal low impedance termination for a 4 wire conversion, and vice versa. The unit feeds 2 wire audio to the 8 channel communication network wired with copper cable medium. An LED blinker indicates the activity of 4 Wire Tx and Rx port upon selection available. An LED glows when 4 Wire Rx (hybrid) leakage exceeds a set value of 100mvpp. Probe monitoring provision for 4 Wire Rx level is available on the front panel. The interface chassis has one module / channel totaling 8 modules supporting 8 channels. I/P & O/P connections are made through BNC connectors. The AGC output is fed to a mute logic circuit to mute the 4 wire receiver amplifier input so that the leakage of the transmitter output into the receiver circuit is kept to the minimum. Additionally the buffered output of 4 Wire Rx is fed to the AGC circuit and the output of AGC circuit is fed to the comparator and this output is used for muting of 4 Wire Tx output when it is present. Dual Power supply with: 230VAC 10%, 50 Hz input fed from main 1 and main 2. 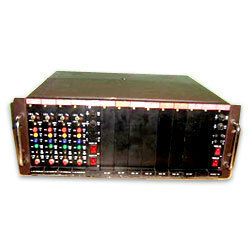 Offering a wide range of Fibre Optic Audio Multiplexer System Interface Unit. These are made from high quality raw material. The aim of the configuration is to interface 2 wire high signal low impedance termination for a 4 wire conversion, and vice versa. The unit feeds 2 wire audio to the 8 channel communication network wired with copper cable medium. The output of the fibre optic converter is fed to the 4 wire Rx terminals through a coupling transformer. The output of the transformer is fed to the buffer stage and then to an amplifier stage. The output of the amplifier stage is fed to a coupling transformer to the 4 wire Rx of the hybrid network. 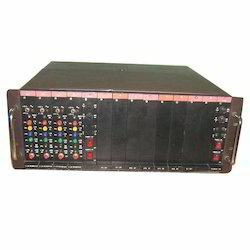 Looking for Fibre Optic Audio Multiplexer System Interface Unit ?